The solid state fermentation is used in the bioprocess production of compounds of industrial applications. The objective of this paper is to characterize and immobilize carboxymethylcellulase enzymes produced by solid-state fermentation of the processing food wastes of acerola (Malpighia glabra), guava (Psidium guajava), cassava (Manihot esculenta), and passion fruit (Passiflora edulis) using the Aspergillus niger. 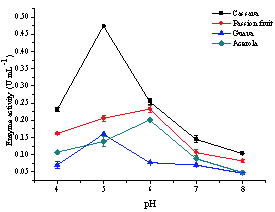 Enzyme activities were determined at different temperatures (40-90°C) and pHs (4.0-8.0). The enzymes were immobilized by adsorption onto silica gel and celite 545 supports. One could observe that the optimal carboxymethylcellulases temperatures of the crude enzymatic extracts from A. niger using acerola, guava, cassava and passion fruit residues ranged from 40-60°C and that the optimal pHs varied between 5.0-6.0. One it was found that the carboxymethylcellulases in these extracts presented high immobilization yields (85%, 93%, 46%, 34%) on silica gel and (91%, 87% 129%, 38%) celite, respectively. The results are promising since it uses inexpensive solid supports and is a simple technique, thus providing optimal conditions for enzymatic recycling.